The 4th of July is here once again, and once again we celebrate the signing of the Declaration of Independence and our independence as a nation. On the 4th, people revel with fireworks, parades, parties, BBQs, and, of course, beverages. But what will you be drinking on this 4th? Have you put any thought into it? Naturally, we would recommend to drink something American made and owned by an American company, as today is a day all about America. Sometimes, this isn’t as easy as you’d think. Budweiser, for example, is one of the highest selling beers by volume in the United States and when people think of America, Budweiser certainly comes to mind as it’s a brewery that first put roots down in America in 1852. Today, however, it’s owned by a Brazilian-Belgian company and headquartered in Belgium. Likewise, some of the classic and most popular made-in-Kentucky bourbons are owned by a Japanese company. Surprise! So, this 4th, here are some beverages we recommend. As many emigrants came to America from Europe, they brought the popularity of cider with them and it eventually rose to the point in the 18th century where it became a staple on every family’s table. New England alone in the 18th century was churning out over 300,000 gallons of cider very year. 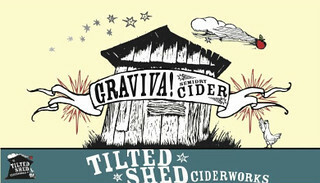 Hailing from California’s Sonoma County is Tilted Shed Ciderworks which owners Scott Heath and Ellen Cavalli call a “hobby gone wild.” They started with organic farming in New Mexico and an old, gnarled, neglected apple orchard became the inspiration to try their hand at cider. With promising results, their hobby turned more serious and they eventually moved to west Sonoma County, an area famous for wine grapes that they thought would translate well to apples for cider…and it did. We recommend their Graviva! Semidry Cider. 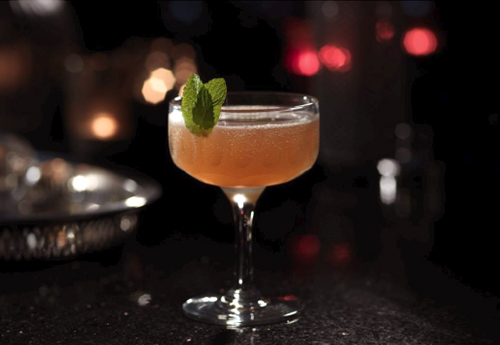 Graviva was created to celebrate and highlight the Gravenstein apple. Lightly effervescent and golden hued with pronounced acidity and a hint of sweetness, this cider pairs best with some of its kindred brethren, Sonoma County cheeses. To everyone’s surprise, the Food Babe [who purposefully isn’t being linked] has just uncovered one of the greatest mysteries known to man: what exactly is in beer? In a stunning revelation that has been on everyone’s mind for three decades, she was able to figure out in just 24 hours what the secret ingredients in beer were. 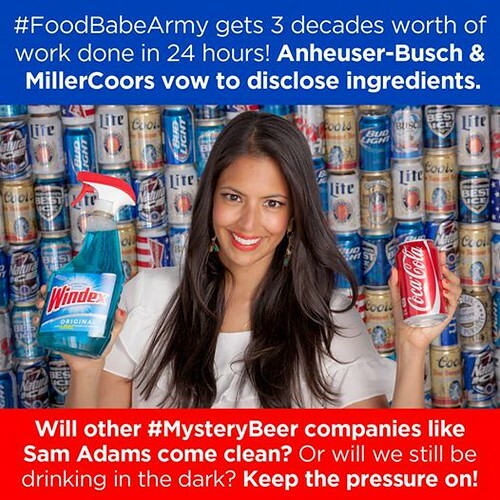 When the Food Babe coerced MillerCoors to divulge their secrets, I couldn’t believe what we learned, that beer is made with water, barley malt, corn, yeast and hops. Adding credibility to her groundbreaking detective work was Alex Jones’ INFOWARS, as she went on his show two days ago demanding answers from big beer. He agreed with her investigation, saying, “Anheuser-Busch isn’t even beer, for about 15 years now it’s a chemical syrup. Folks needs to understand the reason that I don’t drink American beer anymore unless it’s from a microbrewery is because it’s not beer. You drink German or Mexican, because they follow the old brewmaster things of England and Germany.” Ah yes, those famous “old brewmaster things of England” that Mexico is so well known for strictly adhering to. Thankfully these secrets are now out of the closet and once and for all we know exactly what is in beer…and it only took her 24 hours to figure it out. 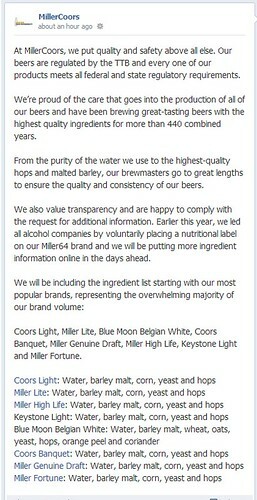 The cat is out of the bag now, MillerCoors. It’s shocking, I know. Next I hope she tackles the special sauce at McDonald’s or peanut butter. Memorial Day is once again upon us and it’s a day where we remember all those who have given so much for America. Mutineer is a proud supporter of our troops (and our own Editor-in-Chief is a veteran of Iraq) and we love it when we see beverage companies stepping in to support our service members, veterans, and their families. Below we have highlighted some brands that have done exactly that. CK Mondavi’s founder Peter Mondavi, Sr. is a World War II veteran and the winery works closely with the Intrepid Fallen Heroes Fund, an organization that provides financial assistance to injured veterans and their families. 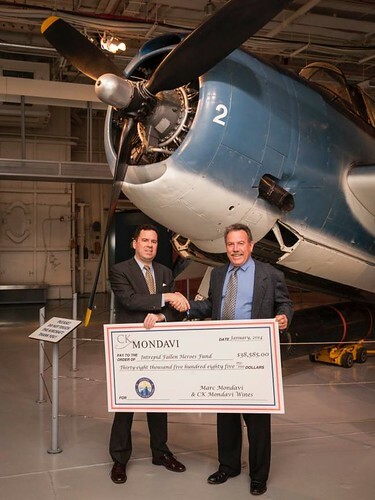 CK Mondavi has donated over $65,000 to Intrepid Fallen Heroes Fund since they first partnered two years ago and their third annual donation program is running now until the end of August. Simply buy a bottle of CK Mondavi, look for an in-store coupon or rebate, and $1 will be donated to Intrepid Fallen Heroes Fund when it’s redeemed. 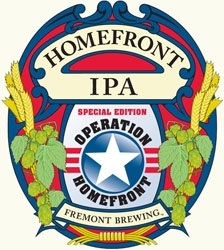 Seattle’s Fremont Brewing first teamed up with Operation Homefront in 2011 to create Operation Homefront IPA. Operation Homefront is a non-profit that provides emergency financial and other assistance to the families of our service members and wounded warriors. The beer, an IPA aged on unused maple Louisville Slugger bats with fresh orange peel added, was conceived by former Mariner Chris Ray and Brewmaster Matt Lincecum of Fremont Brewing. This year, Sly Fox (PA), St. Arnold (TX), 21st Amendment (CA), Cigar City (FL), and Perennial Artisan Ales (MO) have all all joined in on the cause. Each brewery will brew the beer and distribute it to create an even larger net to raise money for Operation Homefront and they hope to raise $200,000 this year. Last year they donated over $125,000. 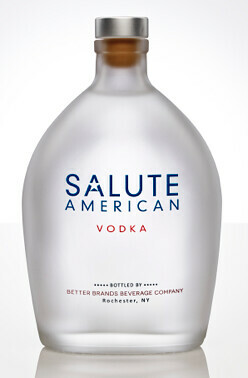 Better Brands Beverage Co., the parent company of Salute American Vodka, recently announced a national initiative geared to assist our nation’s veterans and military families who are in need of financial assistance. Funds donated by Salute American will be earmarked for the VFW Unmet Needs program, which supports struggling veterans and their families. Salute American kicked off the initiative with an initial $10,000 donation and will be a presenting sponsor of the 115th VFW National Convention in St. Louis, Mo., from July 19-23, 2014. Since the launch of Salute American, Better Brands Beverage Co. has donated more than $50,000 to veteran’s charities, including: Veteran’s Farm through Work Vessels for Veterans; Farmer Veteran Coalition; Homes for Our Troops; Wish for our Heroes; and Greater St. Louis Honor Flight. 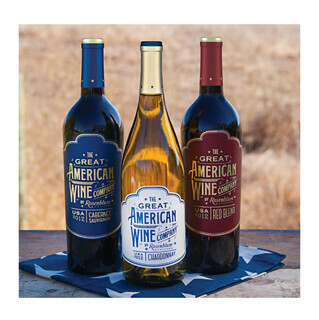 Diageo Chateau & Estates recently announced their newest wine brand: The Great American Wine Company. Made by the winemaking team at Rosenblum Cellars, the brand has committed to a generous annual contribution to military charities to support active troops and veterans. In 2014, the USO will be the primary recipient, and will receive $100,000 donation to support its efforts to provide thousands of programs for US troops and their families worldwide. After sampling hundreds of recipes created by bartenders from around the world, Tales of the Cocktail and Mutineer Magazine are proud to announce the winner of the 2014 Official Cocktail Competition: Joe Cammarata from Backbar in Somerville, Massachusetts with his Hurricane Caesar. Cammarata’s creation trumpeted the Hurricane 2.0 by Naren Young (Bacchanal in New York City) and the Island Slingshot by David Delany Jr. (Grandpa Johnson’s in Los Angeles). The Hurricane Caesar will be featured in an upcoming edition of Mutineer Magazine and will be honored throughout Tales of the Cocktail 2014, being held in New Orleans July 16-20. “I am extremely honored and excited to have the Hurricane Caesar selected as the Official Cocktail of Tales of the Cocktail. As a huge rum nerd, it’s mind-blowing to know that Beachbum Berry, Wayne Curtis, and Ian Burrell chose my drink,” said Joe Cammarata. Here at Mutineer HQ, we are all about cheering on beverage entrepreneurs and their efforts to bring something new to the table. Kickstarter is a great resource for people to bring their ideas to life. The latest project to capture our attention is from Secret Squirrel Cold Brew Coffee out of Los Angeles. Secret Squirrel Cold Brew Coffee has done one Kickstarter project in the past for a limited edition cold brew coffee using beans sourced from Hawaii and now they’re at it again, looking to create a limited edition cold brew coffee using direct trade single origin coffee beans. The coffee beans will then be roasted by LA-based artisan small batch roaster Forge Coffee before being bottled in a 32oz, custom designed, and reusable screen printed growler. Like coffee? Give it a shot! To back this project, click here. 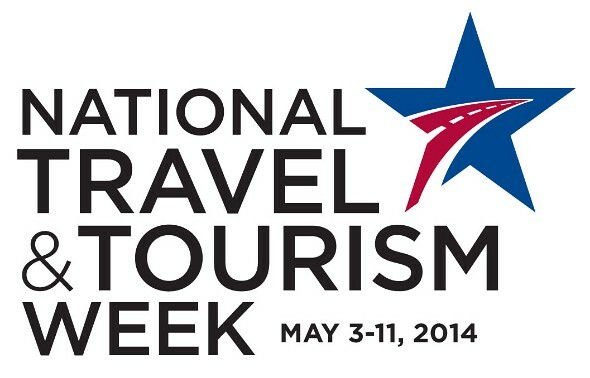 As you [probably don’t] know, May 3-11 is National Travel and Tourism Week. The celebration first came to light by a Congressional joint resolution passed in 1983, and the first official National Travel and Tourism Week was celebrated in 1984. Traveling is incredible. There’s nothing better than traveling to another city, another state, or even another country, and immersing yourself in all the place you’re visiting has to offer. Similarly, tourists are incredible to the local economies that they directly (and indirectly) impact while they’re traveling. One reason tourism is important is because it directly and indirectly creates jobs. According to the World Travel & Tourism Council, in 2011 tourism was responsible for creating 98 million jobs worldwide and by 2022, it is expected to directly generate 120 million jobs. In the US alone, U.S. Travel reports that 14.9 million jobs are created by tourism and $209.5 billion in payroll for those employed directly in U.S. travel. Another impact, obviously, is the money tourists bring to where they are visiting. What kind of money are we talking about? Generated $2.1 trillion in economic output, with $887.9 billion spent directly by domestic and international travelers that spurred an additional $1.2 trillion in other industries. Directly generated $134 billion in tax revenue for local, state and federal governments. Each U.S. household would pay $1,093 more in taxes without the tax revenue generated by the travel and tourism industry. Direct spending by resident and international travelers in the U.S. averaged $2.4 billion a day, $101.4 million an hour, $1.7 million a minute and $28,154 a second. So, why is Mutineer interested in this? Because with the boom in craft beverage over the last several years, beverage tourism has exploded and has played a vital component to the local economies of cities, regions, states, and countries around the world. Whether we’re talking about Scotch in Scotland, Bourbon in Kentucky, or craft beer and cider in Sonoma County, CA, the impact is huge. Let’s take a look at some of those places where beverage tourism has exploded. 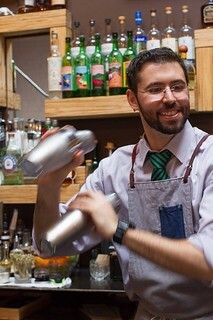 Renowned bartender gaz regan has recently announced the return of Just One Shift. The campaign’s goal is to raise $100,000 during a one week span with all proceeds benefiting Wine to Water. The charity campaign is simple: bartenders from around the world are invited to donate their tips from just one of their shifts during the week of May 12-18th. The 2014 program will take place Monday, May 12 through Sunday, May 18; the first shift kicks off at 7 p.m. on May 12th at The Dead Rabbit in NYC’s Financial District where gaz will be a special guest bartender. All earnings are given to Wine to Water, a 501(c)(3) non-profit organization founded by Doc Hendley, ex-bartender and CNN Hero from North Carolina. Want to be involved? 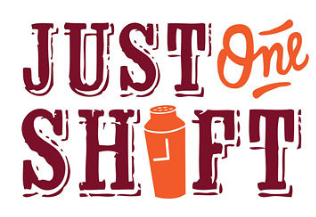 Just visit Just One Shift’s website and sign up for a shift. Once your shift is done, you’ll donate your tips online. On Monday, the James Beard Foundation announced their 2014 winners of the coveted James Beard Awards. For those who missed the winners, we’ll post those that pertain the beverage world below. But first, what cocktails were attendees drinking? Here are two of the cocktails. Muddle lime juice, syrup, mint in a mixing glass. Add rum, bitters, ice and shake well. Strain into cocktail glass, and top with champagne. 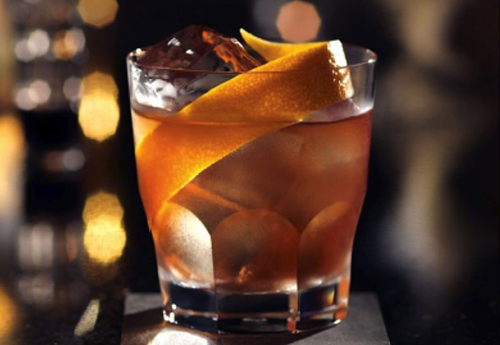 Mix sugar, water and Angostura bitters in an old-fashioned glass. Combine with bar spoon or muddler. Pour in BACARDÍ 8 Anõs, fill with ice cubes, and stir repeatedly.